Love Birds makes its Edinburgh Fringe debut. It’s the 1920’s and the Lochness Monster is running an all avian vaudeville show. Sound crazy, it is. With the show’s star a flamboyant cracker crazed macaw going missing. It’s up to a group of barbershop penguins and a trio of singing and dancing parrots to save the show until he is found. The shows weakest point is the plot. Feeling slightly rushed as both character and story development are forfeited in order to adhere to the 60 minute run time. Leaving you wondering exactly how everyone ended up with a happy ending. The musical score is professionally executed with joy and enthusiasm. Bringing charisma and humour to the performance. 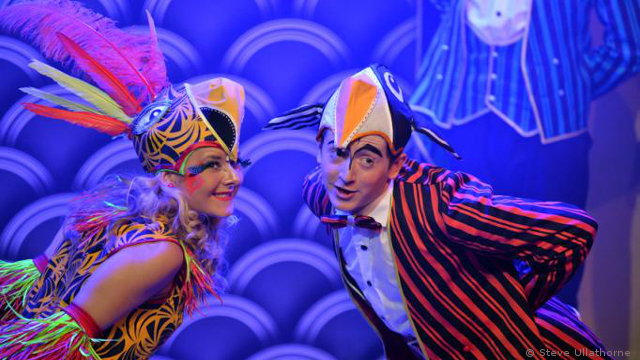 Greg Castiglioni’s vocal talent is showcased well as Balthazar the narcissistic, cracker crazed macaw. Whilst the Mary Poppins obsessed penguins work well together singing barbershop. Joanna Sawyer is not to be outshined either. With her main musical number Paint a Rainbow adding a hint of burlesque style to the performance. The show is meant for a family friendly audience. However, quite a few of the jokes will go over children’s heads leaving adults snickering. Nevertheless, the colourful flamboyant costumes and brightly decorated set will keep children entertained. Bringing razzle dazzle and sparkle to the performance. Love Birds, Pleasance Courtyard (Venue 33) between the 5th-31st August. At 12:35 Find out more and get tickets here.